Sebastian Vettel took his 8th pole position of the season with his last effort in qualifying for tomorrows US Grand Prix. It was only ever about which Red Bull would be claiming top spot after the hour session, with both Webber and Vettel duking it out to the Chequered flag. 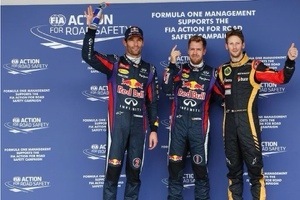 Ultimately, Webber had to settle for second best, whilst Grosjean once again headed the race behind the Red Bulls by claiming 3rd place on the grid for tomorrow’s race. The hard and medium compounds were the tyres of choice by Pirelli for qualifying at The Circuit Of The Americas. Many drivers were really struggling for grip on a slippery surface affected by the very strong 6.2 m/s tail wind which proved tricky for many throughout the entire first sector. After a strong FP3 performance, The Hulk was quick to complain on his first run in Q1, as he radioed in from the car that his brakes felt different to Free Practice earlier in the day. The team confirmed that they changed the German’s brakes, yet had not told Hulk before Qualifying had begun. Elsewhere, his team-mate Guttierez was fairing no better on his early runs. Getting some temperature into his tyres on a warm up lap, he looked to block the Williams of Pastor Maldonado on a quick run going into the final corner – was the Sauber man to get a penalty? With 9 minutes gone of the session, the Red Bull’s were the only cars not to have ventured out onto the circuit, showing the confidence both drivers had in the cars ability. Grosjean was keeping up his fine form since the Summer break by completing some very competitive lap times – topping the session with a 1.38.6, 1 tenth ahead of the fantastic Valterri Bottas in the Williams. For the final runs of the session, both Ferrari’s and Hamilton were quick to switch to the medium compound tyres in search of some grip, which surely would trigger the rest of the field to follow. As we entered the final 3 minutes of Q1, the Red Bull duo of Webber and Vettel went P1 and 2, with Webber pipping Vettel on a 1.38.5. Hamilton followed soon after to bring the bar down to 1.37.9, however the show was completely stolen by Bottas who dragged his Williams up to P1 – the first time a Williams topped a session since Maldonado at Monaco in 2012. In the bottom 6 was a frustrated Adrian Sutil, along with a bitter Pastor Maldonado and the two Marussia’s and Caterham’s bringing up the rear of the grid. The session was a very slow starter, and only with 5 minutes gone had drivers really started to post some competitive lap times on the medium compound tyres. Hamilton topped the timesheets with a 1.38.1, followed by an on form Di Resta and Bottas once again who continued to show some great pace. The change by Williams to adjust the car back to a non Coanda set up looked to be giving the Finn the confidence he needed behind the wheel. Perez too was quick to join the top 3 on a 1.38.1, with now 4 drivers separated by less than 1 tenth of a second. One team who were struggling over the weekend were Ferrari, and Felipe Massa had no pace throughout the entirety of qualifying. He was sat outside of the top 10 in 11th pace as the session wore on. With 4 minutes to go, Grosjean was once again looking quick as he topped the time sheets with a 1.37.5. However as both Red Bull’s took to the track he was soon displaced at the top by Webber who went 2 tenths clear, but it was Vettel who stamped the Bull’s dominance as he overtook his team-mate to take provisional 1st place with a 1.37.0. The huge surprise however came further down the order outside the top 10, as both Felipe Massa and the Mercedes of Rosberg were out of Qualifying, finishing 14th and 15 respectively – both drivers were really struggling with the balance of their cars in the changed conditions. Joining them was Ricciardo, Di Resta, Button and Vergne. But the standout performer once again was Bottas, who dragged his Williams up to 4th by the end of Q2, enforcing the true pace he had during the afternoon. Everyone in Q3 was quick to jump on to the medium compounds, Bottas however was only interested in setting sector times on his first run and swiftly came back into the pitlane. Of the 5 who were planning to run early on in the session, Webber went comfortably top with a 1.36.7 – a great lap all round, whilst Vettel was 2nd a tenth down on his team-mate. Webber was not finished, and on his second run he moved the goalposts even further down the road with a 1.36.4. Hulkenberg once again proved his pace in the Sauber was genuine from earlier in the weekend and went 3rd with his effort – however he was quickly displaced by Grosjean who looked set to be best of the rest. Hamilton could only manage 5th place, whilst Alonso managed to drag a horrendously bad handling Ferrari up to 6th, but it was Vettel who pulled out all the stops on his final attempt to grab pole position from under the nose of Webber. The German was 2 tenths down over the course of the lap, but had a huge final sector to go top by 1 tenth over his team-mate. McLaren’s Perez was 7th, who was doing his job hunt for 2014 plenty of favours, whilst super sub for Kimi Raikkonen – Kovalainen was 8th, followed by a tremendous Bottas in 9th (driver of the day) and Guttierez in 10th. One stop is theoretically the quickest way to complete the 56-lap United States Grand Prix. The fastest strategy should be to start on the medium, change to the hard on lap 19 and then continue to the finish. An alternative (resulting in the same overall race time) is to start on the hard tyre, change to the medium on lap 37, and then go to the finish. Some drivers may try a two-stop strategy, if they feel there is enough speed in the car to make it work. In this case, the fastest strategy is to start on the medium tyre, change to the hard tyre on lap 10, and then change to the hard again on lap 33. We did our best to filter out “… that’s racing” as the way to end all answers in a way to discourage further questions. Now we have “… so, err … yeah!” as the standard way to half-answer a question and make it seem like you’ve made a point when you haven’t. EVERYONE is doing it (including Ant Davidson in pieces to camera, which is particularly annoying). VET: 5 times during the answer to his first question. WEB: 8 times during the answer to his only question. GRO: 2 times during the answer to his only question. VET: 4 times during the answer to his second question. So there we have it – WEB was ahead of VET by 3 until VET got to cross the line last and beat him by one extra occurence. GRO really needs to up his game if he stands a chance of being up there at the front. And yeah has been part of Aussie english since they started talking the lingo when the convict ships arrived. Actually my son and I had a laugh watching Webber during the interview. Apart from him being totally bored with the whole charade, we both came to the conclusion he was taking the piss searching for another cliche to trot out, all the while the audience hanging on to every word. Firstly, it was just a bit of fun. I wasn’t poking fun at anyone’s English – the non-native speakers do a far better job than I could of their language. “There or thereabouts” – worst offender being Johnny Herbert. Also, Gary Anderson oft repeating Murray Walker’s “F1 is IF backwards”. Then be grateful you don’t have NBCSN coverage, because they all love that one. then be really grateful you don’t have to watch Stella Bruno on RAI, she’s absolutely hilarious. Those of you who have ever seen her, know what i’m talkng about, those who haven’t, just picture this. Stella Bruno interviewing Robert Kubica after he took pole in Bahrain 2008. And be really grateful you don’t have to watch RAI with Stella Bruno, she’s absolutely hilarious, those who have ever seen her, know what i’m talking about. But to those who didn’t, just picture this, Stella Bruno interviewing Kubica after he took pole in Bahrain 2008. Stella:” So ehhmm… you ehmmm pole? Stella:”(now looking in disbelief) you think you on pole you’re whole life??”. Kubica:”Never mind” ( walking away laughing and shaking his head). “yeah no”, mostly used by Horner but rapidly spreading through the paddock, makes we want to extract my teeth with a JCB and a two rope.